Dis movie more boring den Fozzie Bear’s off-off-off Broadway production of “Old Coronation Street Episodes”. It so bad dat monster invite friends over and invent Superman Returns drinking game. Everytime someone begin to doze off while watching movie, he have to do shot. By end of movie, not sure if Big Bird and Grover pass out from Jagermeister or sheer boredom. Me tink both. Movie begin wit Superman returning to Earth after being away for five years to visit what left of his home planet: Krypton. Why he go? What he find? Why it take him 5 years? Dis never explained. 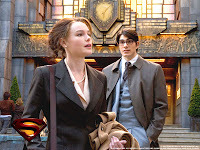 Coinsidentally, his alter ego, Clark Kent also return to work at de Daily Planet. He horrified to diskover Lois Lane did not put her life on hold for him. She not only have a son, but she be married to X-Men’s Cyclops! Superman prove himself a super-creep by stalking Lois, spying on her and her family wit his x-ray vision, den trying to seduce her by flying her around de city and trying to kiss her on a rooftop. (Please, do a shot). She pissed at him becuz he left Earth witout telling her he was leaving. Why he never said goodbye to her? Dis never explained but reason be clear. Superman be utter douchebag. Uh, she be married, right? 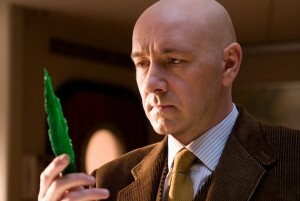 Meanwhile, Lex Luthor have big plans to cause world chaos and grow an island in de ocean blah blah blah. (Please, do a shot). Power fluktuates. Earth shakes. Planes fall out of sky. Superman save de day. Movie plods along. Someone forget to tell aktor Brandon Routh dat Clark Kent de boring one, NOT Superman! Lex contemplate de art of de shiv. Lois and her son somehow end up on Lex’s private yacht where he plot to enact his island-growing plan (yawn. Please do another shot.). But clever Lois send stealthy fax alerting Cyclops. Thug start to beat her up but her son trow piano at him, demonstrating super strength and suggestion dat he be Superman’s son. Oh, and also suggest dat nice guy Cyklops be a cuckold. Or dat Lois go to bed wit Cyklops maybe a couple of weeks after sleeping wit Superman in Superman II. Yacht sinks. Superman save Lois. He end up on new landmass dat it turn out be made of kryptonite. Superman weakened and, in incredibly overwrought scene, beat up and stabbed wit a kryptonite shiv. Superman plunge of cliff. BUT he saved by Cyklops and Lois. Superman pick up landmass and chuck it into space, nature’s cosmic garbage can. Lex and his annoying girlfriend eskape in a helictoper dat eventually run out of gas, so dey end up stranded on a deserted island – wit nothing to eat but a coconut and a small dog. Superman rushed to hospital. He be in a coma! But Lois and son visit, give him a kiss and make him all better. Verdikt: Curse of Superman alive. 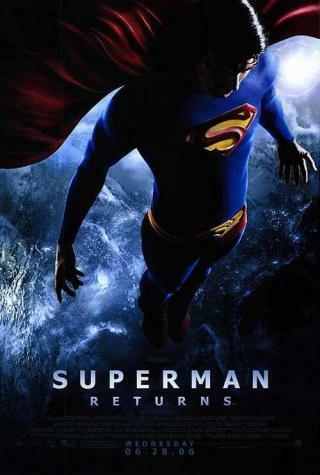 Dis film confirm: It impossible to make a good Superman movie! Rating: 4 out of 10 chocolate chippee cookies.